Our water-rétention crystals absorb until 400 times their dry weight in water and restores it in the form of humidity according to the needs of plants. Before any use of the swollen crystals, it is imperative to drain them actively (by shaking them in a sieve for example) to evacuate any surplus of liquid. It is important to remind that in spite of their needs for humidity, the roots of orchids are very sensitive to the rot that the stagnant water could cause. 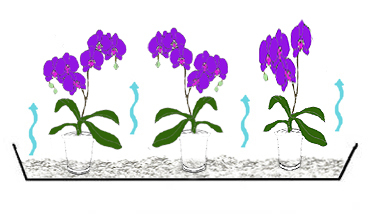 In a tray, grow-pots containing your orchids are put on a of 3 cms layer of swollen crystals. Thanks to a natural phenomenon of evaporation, crystals are going to moisten the atmosphere around your orchids and will protect them from the dryness. Without, , replacing however the watering, this solution allows to manipulate and to move the pots easily, it offers in more the possibility of checking quickly the state of the roots of your specimens. 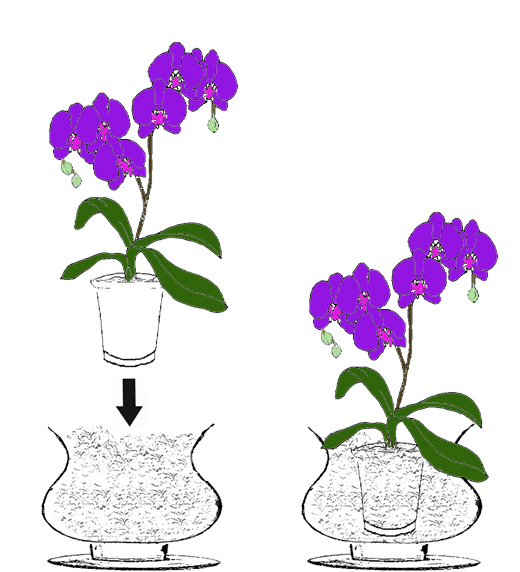 In a vase, a plant pot or quite different suitable bucket, the orchid in its grow-pot and its substrate is completely plunged into the swollen crystals. The grow-pots are generally draining with numerous openings (holes and/or cracks) which are going to let humidity to penetrate. Simple and esthetic this solution is to be favored when ornamental pots cover are wide enough to welcome the grow-pot. 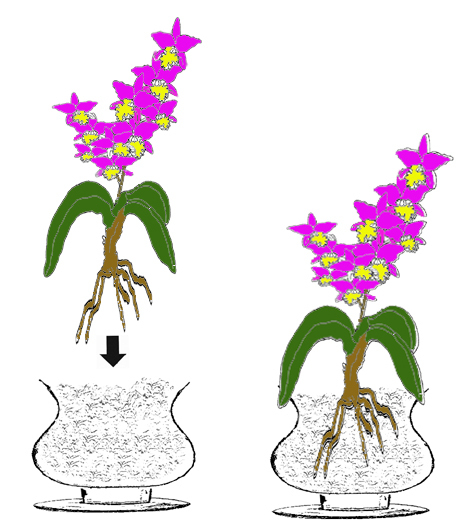 In a vase or a plant pot, the roots of the orchid are cleared of their substrate as well as the grow-pot and arranged directly in the swollen crystals. Possible only for the epiphytic orchids, this delicate manipulation is to be reserved for the too narrow plant pot to welcome the grow-pot.